We are regional manufacturers and distributors of gaskets and other fluid containment products, with manufacturing capabilities focused on clients in oil and gas production, petrochemical, oil refining, and pulp and paper industries. A.R. Thomson Group manufactures a wide variety of gaskets by forming, CNC machining, CNC laser & blade cutting, stamping and winding operations. 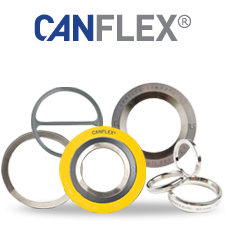 Contact us for more information on CANFLEX sealing products. A.R. Thomson Group is committed to ensure long term performance and reliability of rotary joints. We are the Christian Maier Authorized rotary joint repair facility for Canada, with factory-trained personnel in our head office in Surrey, British Columbia. A.R. Thomson Group’s Hose Testing mobile unit comes fully equipped with the most common end connections. We test hoses on-site which provides a greater level of safety and convenience to the end user with a reduced cost of ownership. View our Hose Trailer Brochure. A.R. Thomson Group’s Satellite Warehouse Program is a mobile trailer unit stocked with gaskets, studs and nuts, and other fluid containment products to enhance service and supply during major projects or plant turnarounds. View our Satellite Warehouse brochure. A.R. Thomson Group’s CNC Machining department can produce custom machined seals, plastic parts, and prototypes in small and large quantities which saves customers initial tooling expenses. Our Engineering department can also assist in designing and drafting your custom sealing system. View our CNC Machining brochure. A.R. Thomson Group’s Laser Cutting Center is capable of cutting a wide variety of standard metals and specialty alloys including brass and copper. We have extensive experience in CAD/CAM programing and product nesting to maximize material usage. We ensure the end product is manufactured to the highest degree of accuracy and quality based on our customers’ specifications. View our Laser Cutting Brochure. A.R. Thomson Group offers an affordable, accurate, and thoroughly-documented Steam Trap Management service that provides customers a complete picture and analysis of their trap population. This service is part of our ‘Triple E’ Program. A.R. Thomson Group has industry-trained Product Managers and Specialists for our entire line of fluid containment and control products. We thoroughly gather and analyze application data and recommend the most effective system and product applications, enabling our customers to make the best decision for their operations. The A.R. Thomson Group places a high level of importance on ongoing Product Training Sessions for our distributors and customers. These sessions are available by webinar, at our branches, or on-site at our customers’ facilities. All sessions are conducted by Product and Process Specialists with numerous years of industry experience. As Total Sealing Integrity and Asset Management specialists, A.R. Thomson Group helps customers to ensure bolted joint integrity through proper gasket selection, practical bolting procedures, inspection, education and consultation. These complementary services ensure our customers maximize the benefits and long-term reliability of their fluid sealing products. View our TSI Brochure.